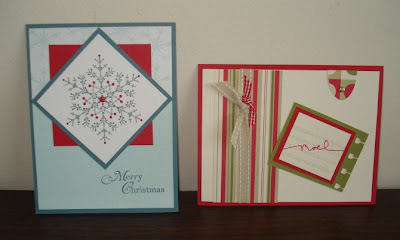 Craftin' Caro: Next Xmas card camp - Wed August 15! Next Xmas card camp - Wed August 15! I'm sure there are some of you out there in Stampin' Cyberland who think we're nuts to be working on our holiday cards in the summer, but let me tell you -- it's VERY satisfying to be making inroads on my scarily long Xmas card list NOW! If you'd like to attend or else order my class "To Go", please visit my Classes & Events page HERE. TOTALLY not nuts - LOL! I have about 75 Christmas cards to make, so starting now makes PERFECT sense...and that's just what I did! Slow but sure, I am making my way through my cards...12 per day. Using Loads of Love - SO CUTE!